Ramakrishna Ashrama Argentina: MADRE, oh MADRE querida! (Thanks to Prof. Angelica Landreani for this wonderful painting). MADRE, oh MADRE querida! ¡Madre, oh Madre querida! Eres Tú Todopoderosa, Virgen inmaculada. para la Ma Argentina bien amada! ¡Madre, oh Madre querida! ¡Madre, oh Madre querida! brille con la prosperidad toda. con la abundancia y alegría. Mother, oh dear Mother! You are all powerful immaculate Virgin! 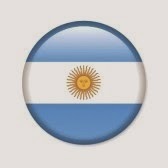 Please do something special right now for beloved Ma Argentina. Let every woman, every man shine here with all prosperity. I sincerely pray today that from Jujuy to Tierra del Fuego may shine by your grace, with joy and affluence. Mother, oh dear Mother.